Posted on January 12,2019 by Charlie Stimpson. 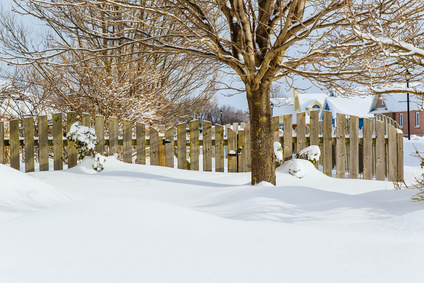 Did you know that if you install a fence during the winter months, you’re more likely to have your pick of fencing companies without having a long wait for availability? Simply because everyone has the same idea that it’s better to do garden work during the summer months, the winter months tend to lend themselves to better availability for professional garden fencing companies. During the winter months when plants have died back slightly is an ideal time to install new fencing. You won’t be worrying about your precious plants getting damaged whilst in bloom, and the likes of roses and bushes can be trimmed back during their winter dormancy to grant better access for your fencing company. If any plants or lawn needs to be removed or replaced due to the siting of your new fence, you will easily be able to see any bare patches or gaps in your planting during the winter months. Similarly, by replacing them after having a winter fence installed, they’ll be establishing themselves by the spring and summer months, ready for you to enjoy. Installing a new fence will give your garden better protection against the likes of wind damage. This will help to protect some of your less hardy plants, and even the likes of evergreens, which do not do well under wind damage. Furthermore, if you’re replacing an old fence, it’s better to do so sooner rather than later, even if that means during the winter months. You do not want an old fence or fences posts fall on top of your plants due to storm damage! 4.Enjoy your Garden in Spring and Summer! And the best bit about installing a new fence during the winter months? Your garden will be smartened up and ready to enjoy come the warmer spring and summer weather! If you’d like to install a new fence in your garden ahead of spring and summer, get in touch with D&G Fencing now. The winter weather does not deter us, and we are happy to install new fencing in Brentwood, Hornchurch and Upminster and year round!